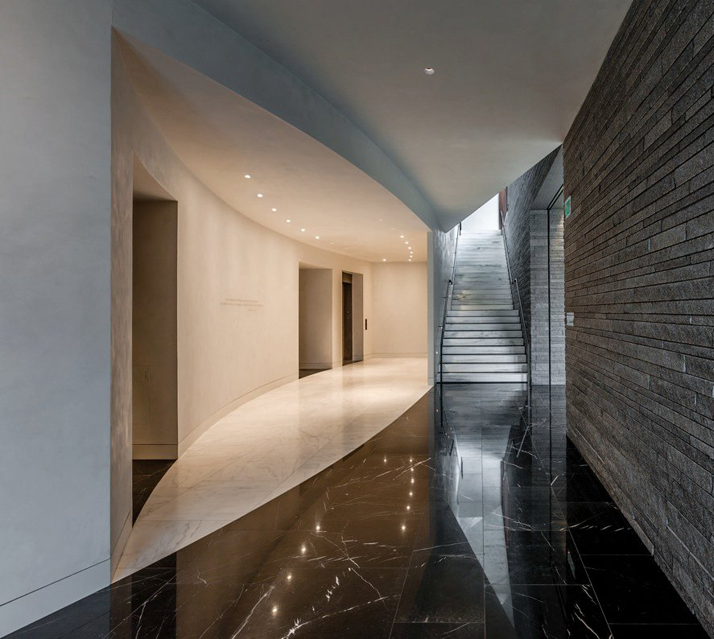 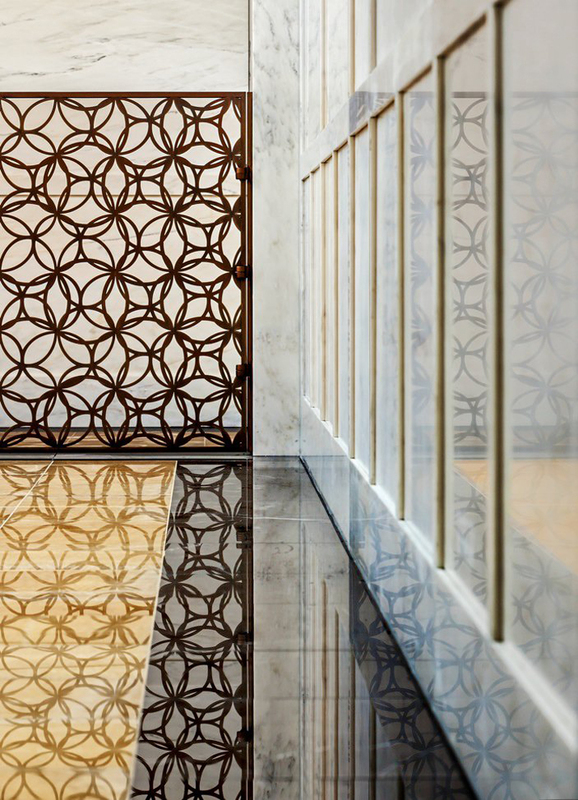 Stunning attention to detail by HGA Architects and Engineers. 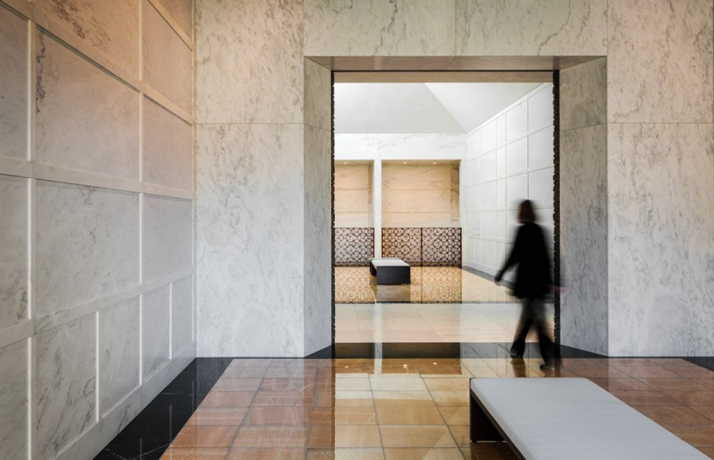 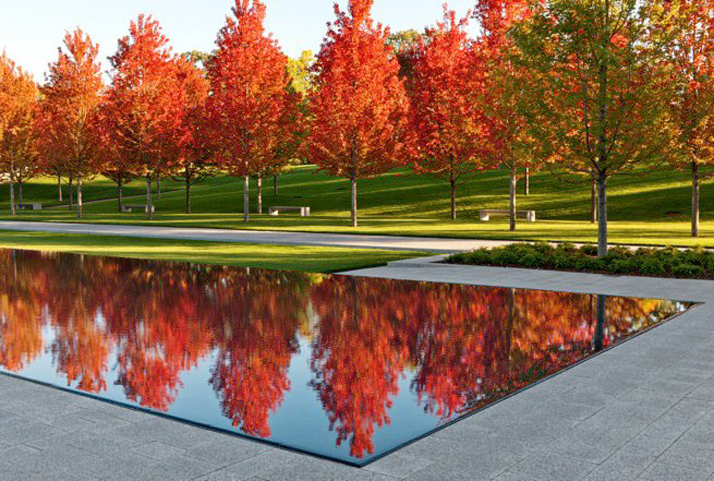 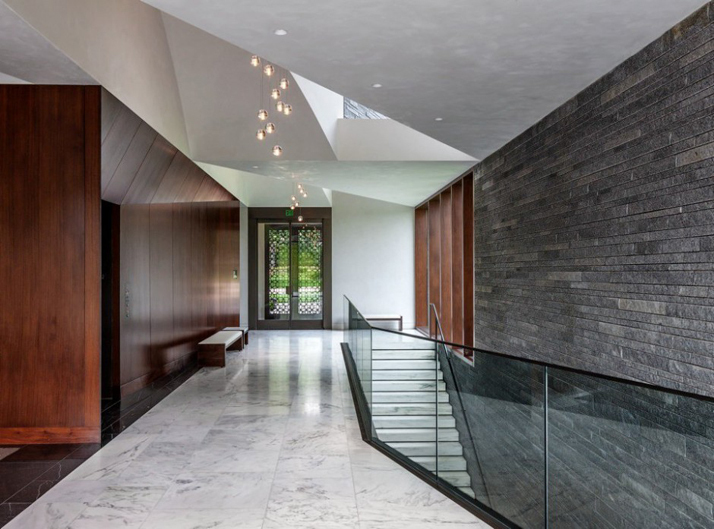 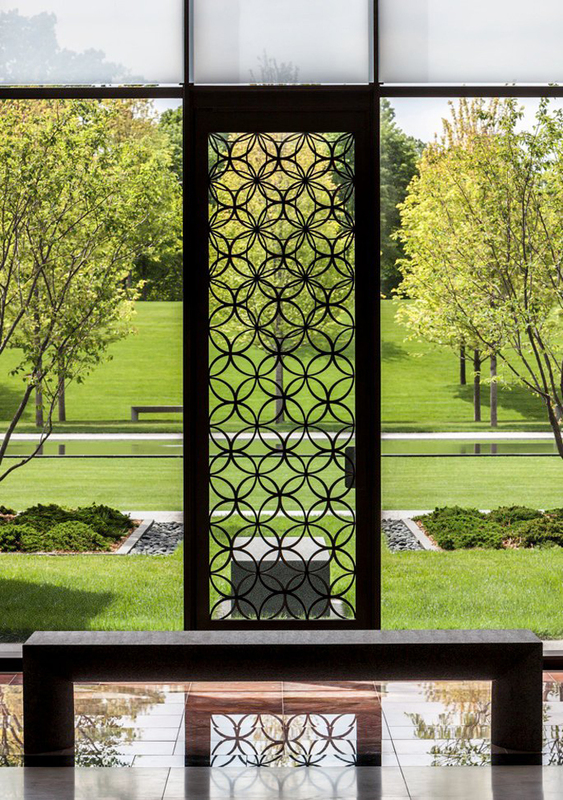 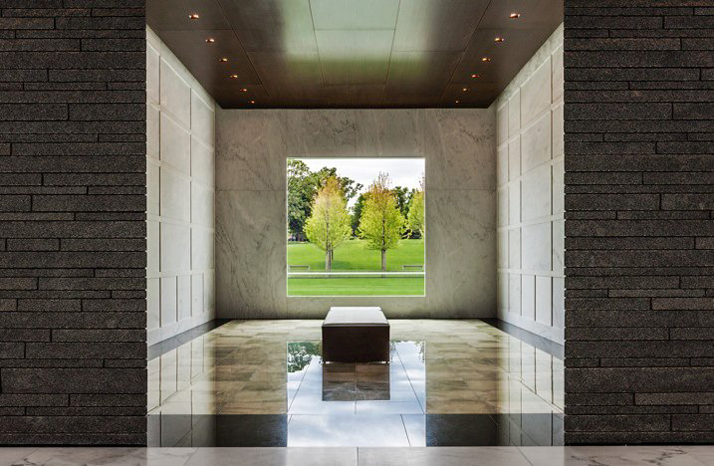 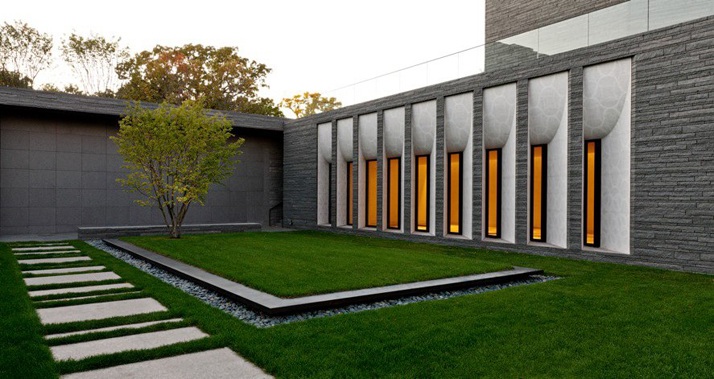 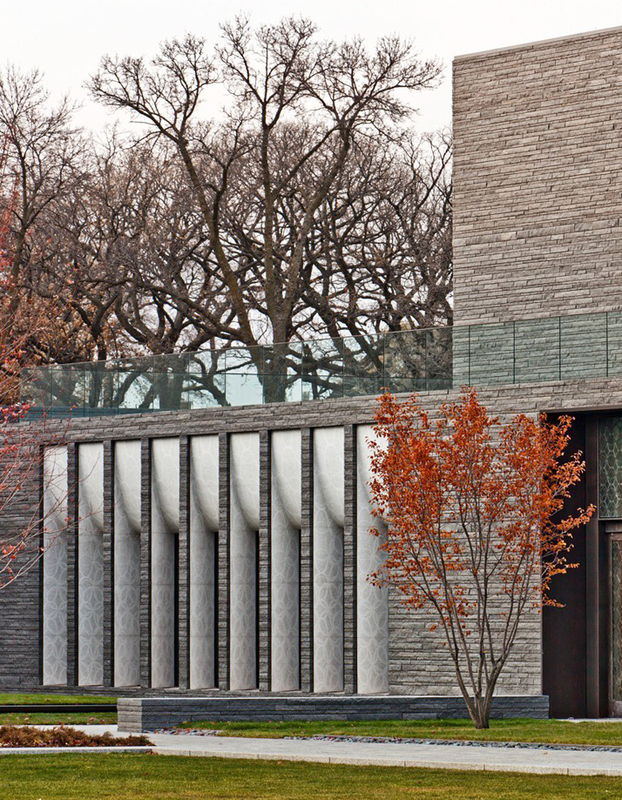 Joan Soranno and John Cook of HGA Architects and Engineers have designed the Garden Mausoleum, located within Lakewood Cemetery in Minneapolis, Minnesota. 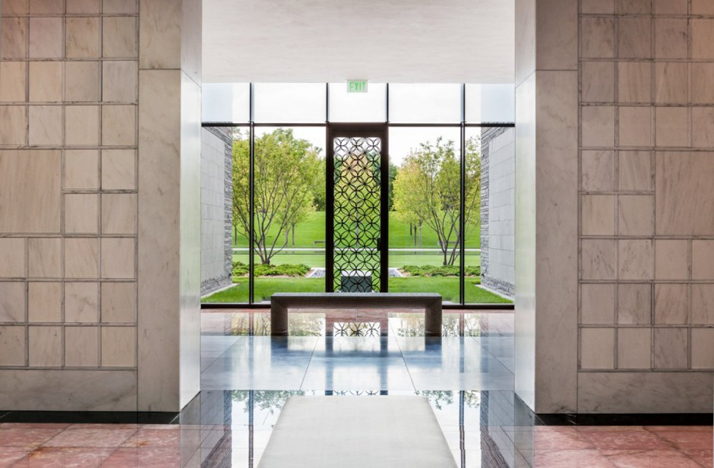 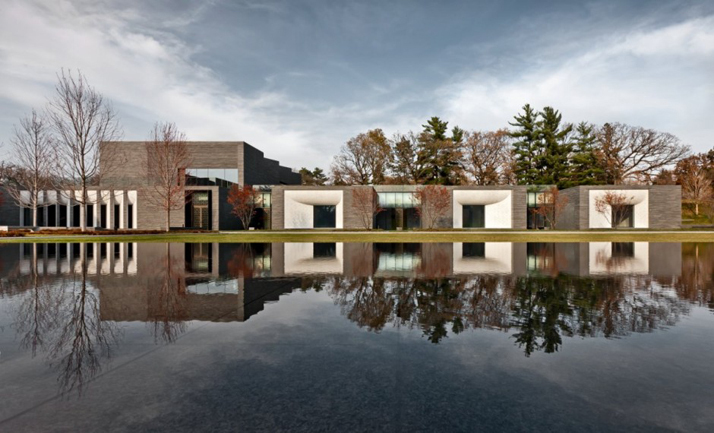 "Governed as a non-profit from its beginning, the Lakewood Cemetery Association recognized the need for prudent planning to ensure its vitality for the indefinite future. 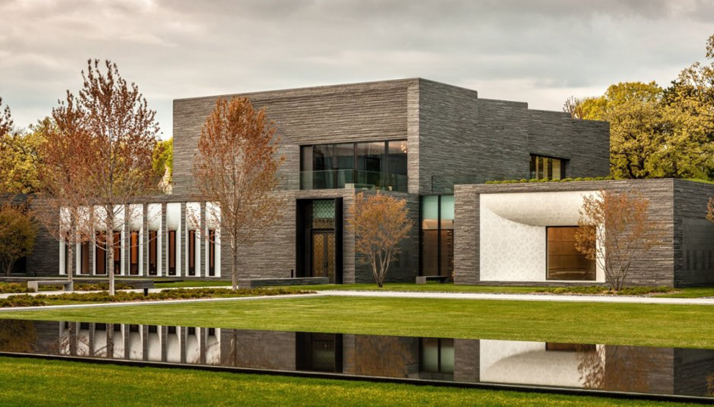 Despite the broad expanses of Lakewood’s grounds, a mere 25 acres remain available for future development. 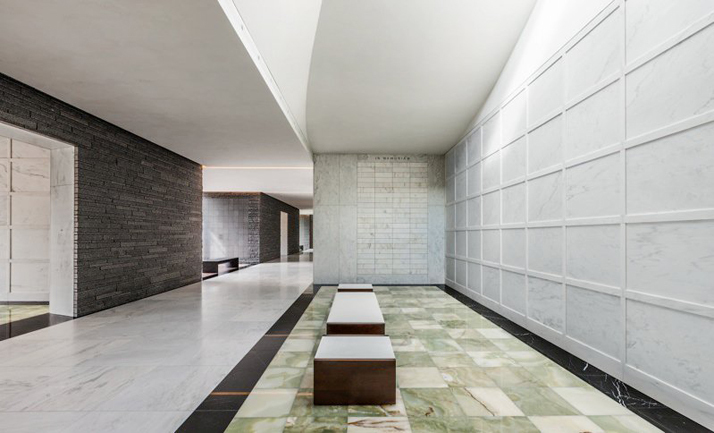 With an existing 1967 Mausoleum nearing capacity (due largely to the increased acceptance and interest in above ground burial and cremation) the Cemetery’s Board of Trustees commissioned a comprehensive Master Plan in 2003. 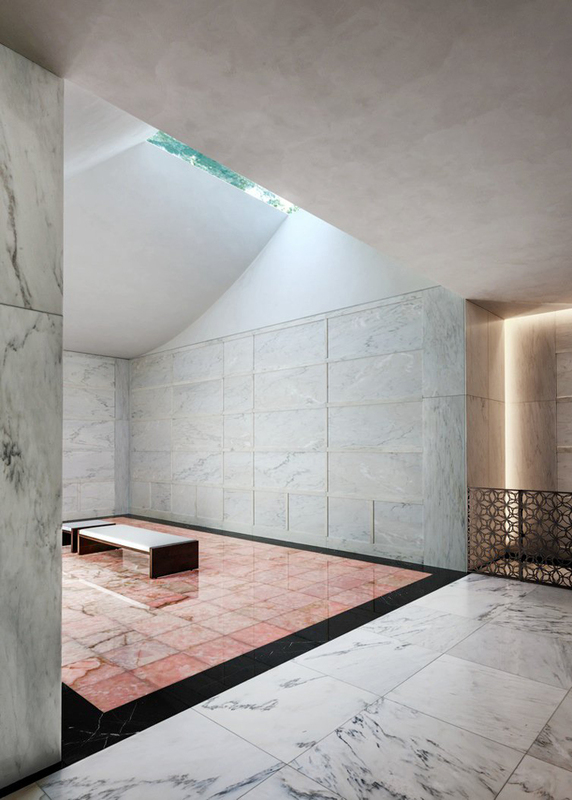 The lynchpin of the plan called for a new Mausoleum to expand above ground options for crypt and cremation burials, and to accommodate contemporary memorial rites and practices. 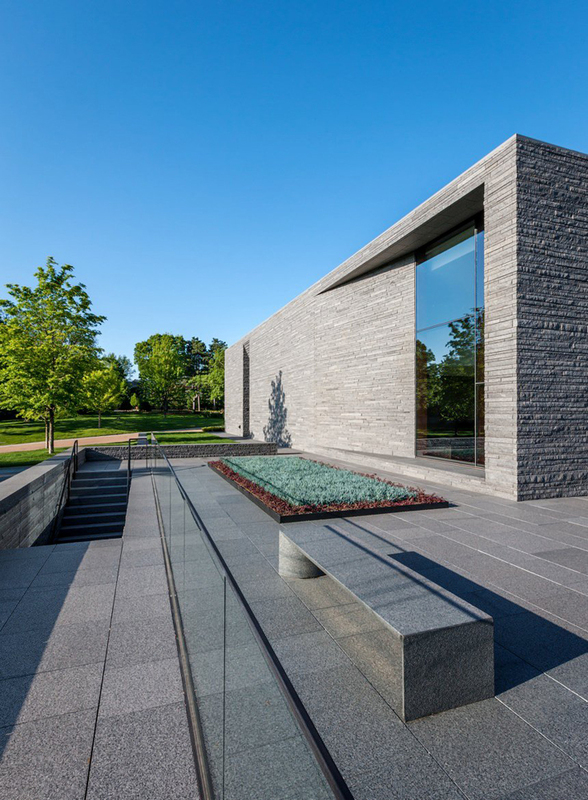 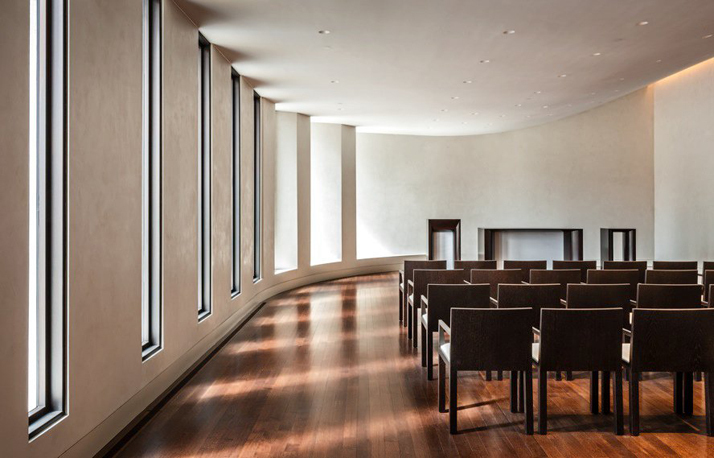 The project, a new “Garden Mausoleum” called for burial space for over ten thousand people, a committal chapel, a much needed reception space for post-service gatherings, and new landscaping for the surrounding four acre site." 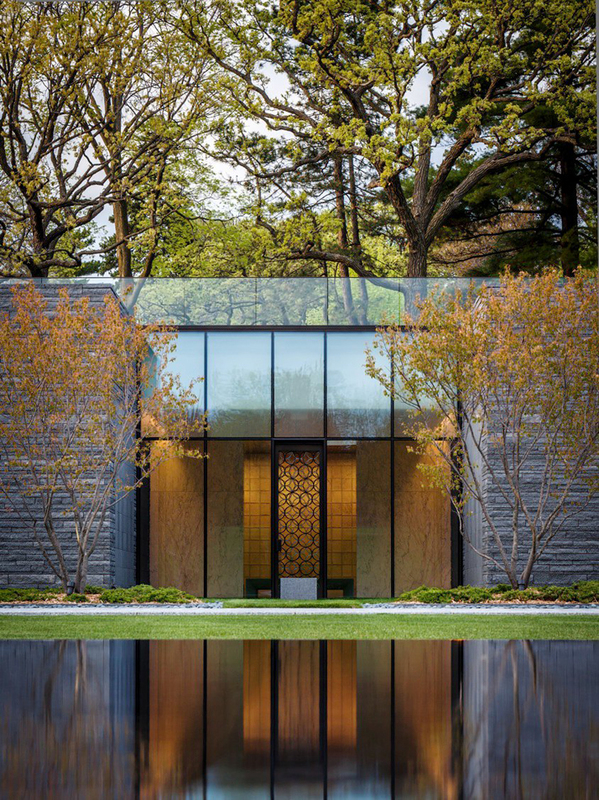 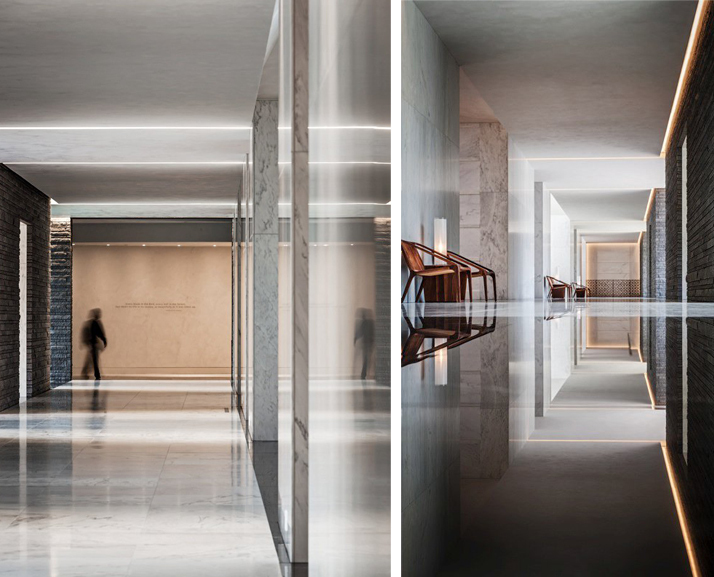 "Challenged with the task of adding a large structure – 24,500 square feet – to a much beloved place, Joan Soranno, FAIA and John Cook, FAIA of HGA Architects and Engineers quickly committed themselves to a strategy that protected and enhanced the cemetery’s historic landscape. 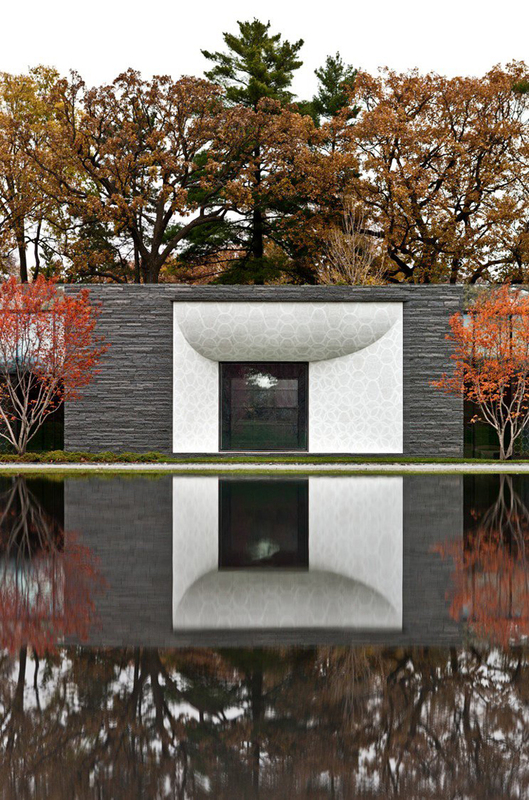 A large building, no matter how artful, was bound to detract from Lakewood’s pastoral beauty. 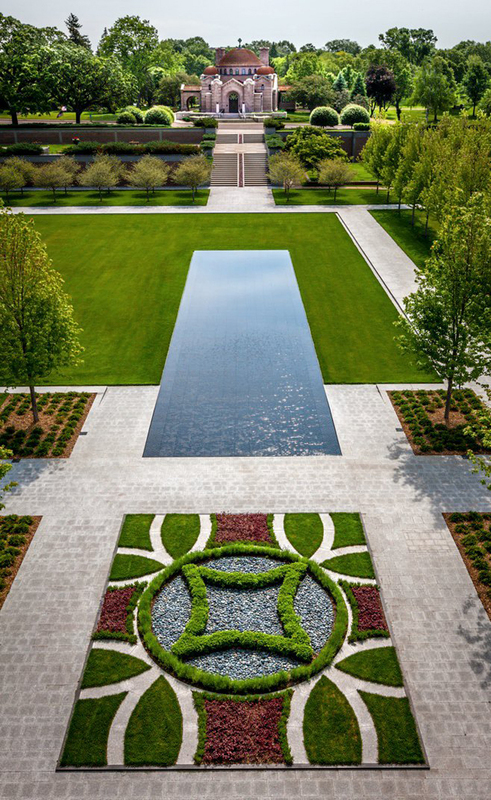 Following an extensive site analysis, Joan and John chose to locate the building along the northern edge of a 1960’s era “sunken garden.” By placing the new Garden Mausoleum between the existing, two-story mausoleum on the west and the cemetery’s 1910 Byzantine styled memorial chapel on the east, development is clustered around one location near the cemetery’s entry. 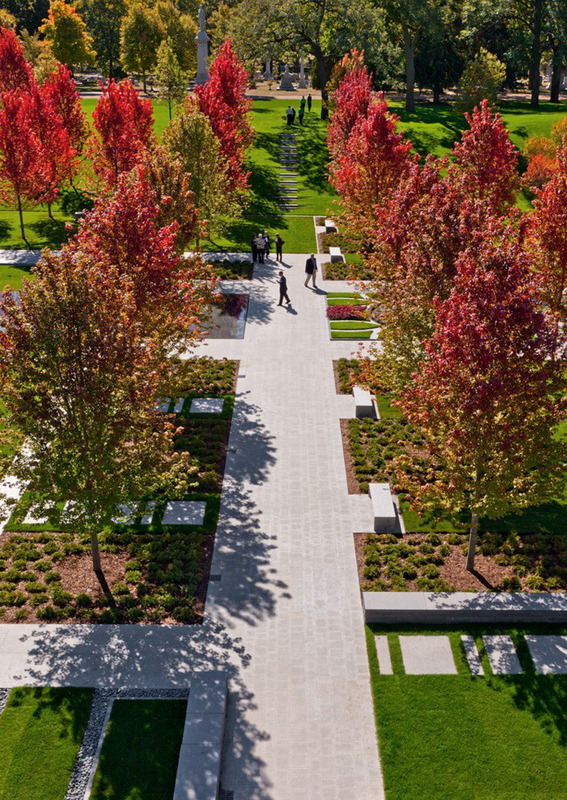 This has the benefit of consolidating much of the high traffic and infrastructure to a discrete precinct within the grounds, leaving the vast majority of the original landscape and critical view sheds undisturbed." 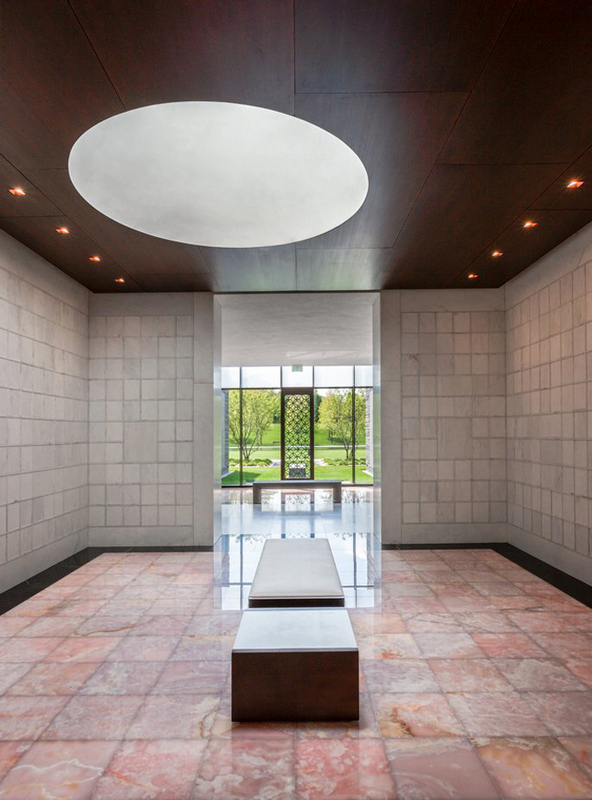 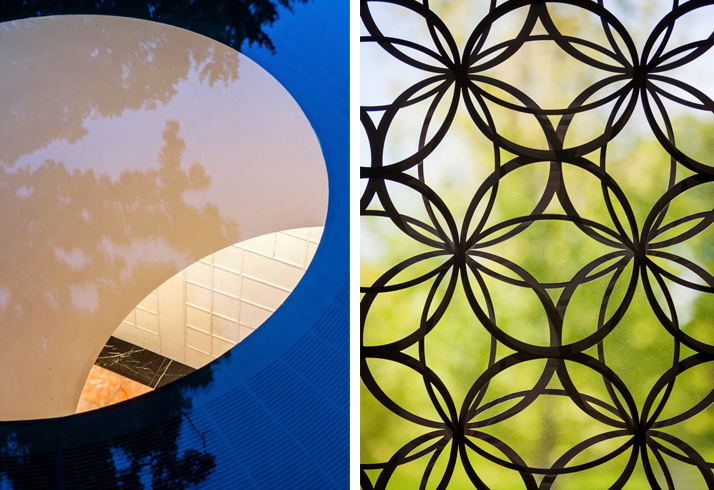 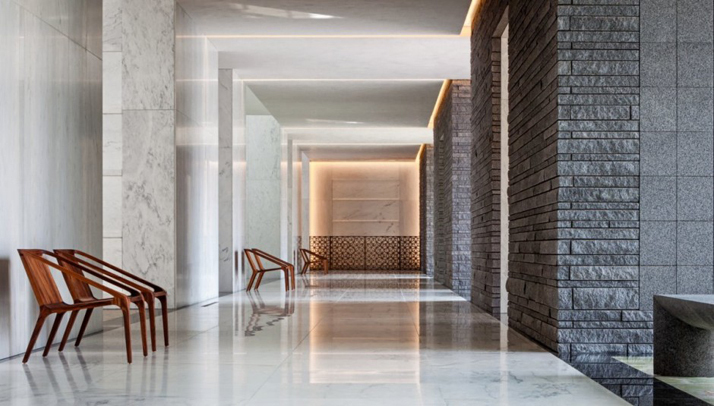 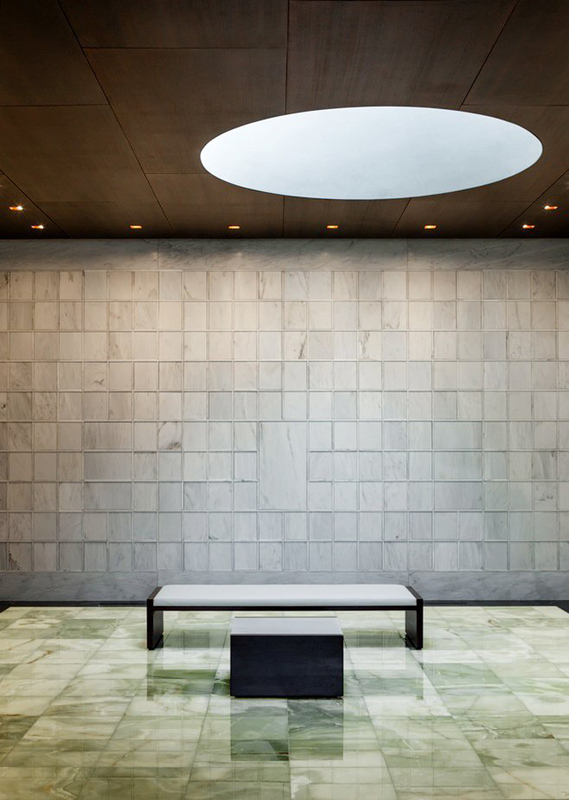 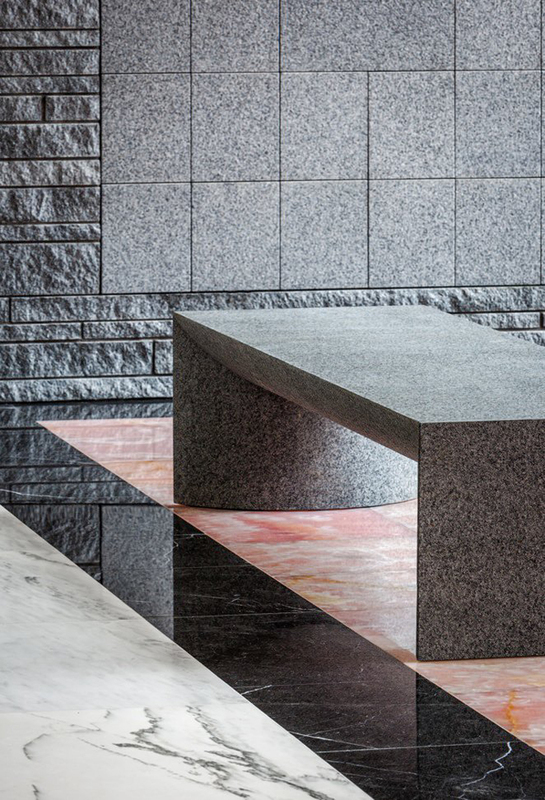 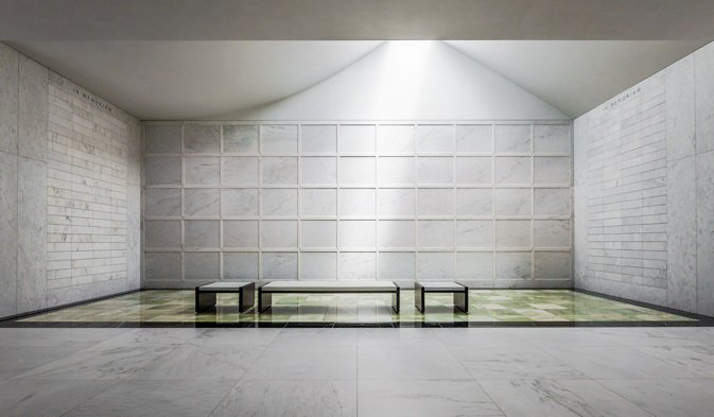 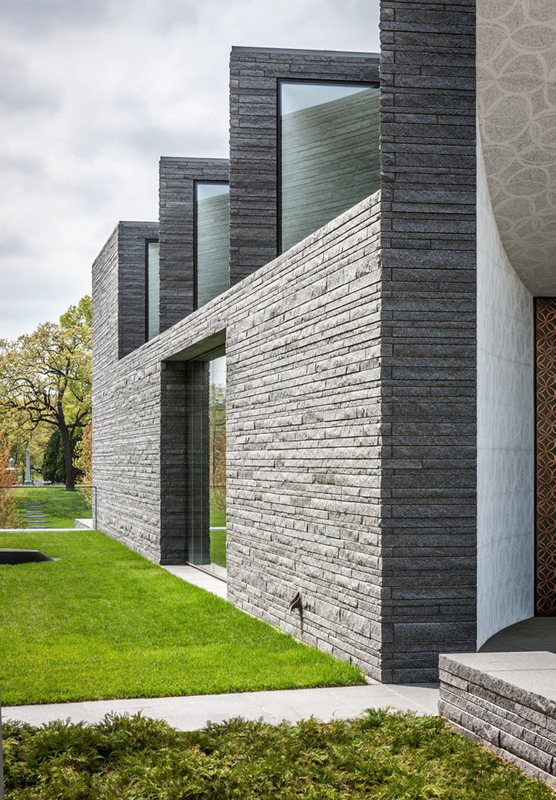 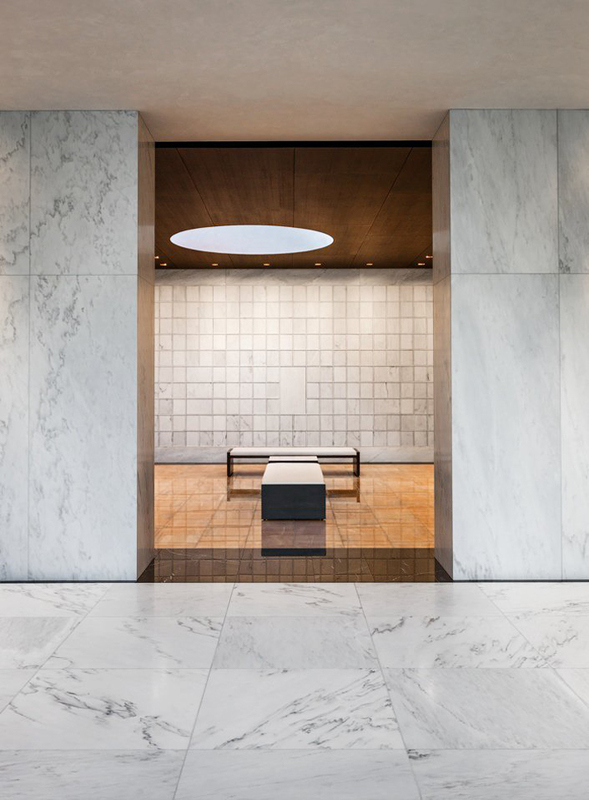 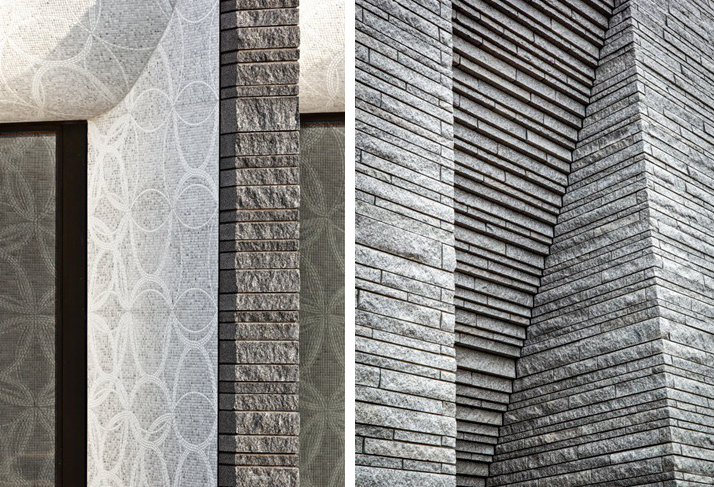 "The Lakewood Garden Mausoleum, true to the Cemetery’s non-sectarian mission, builds its meaning from the most common and indelible aspects of human experience – the immediacy of light and dark, the immutability of squares and circles, and the echo of stone surfaces. 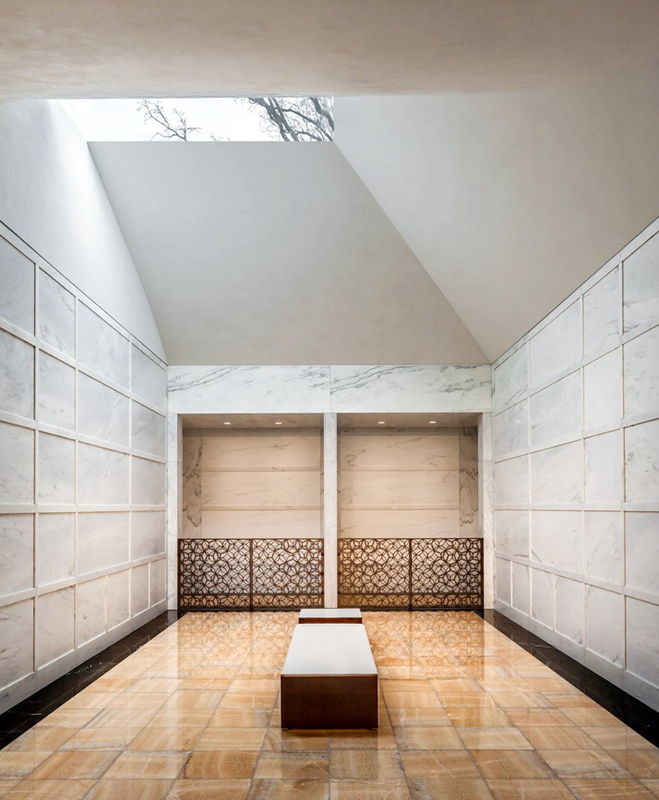 An unabashed 21st century building, the design of the Garden Mausoleum is not going to confuse anybody about what is old and what is new. 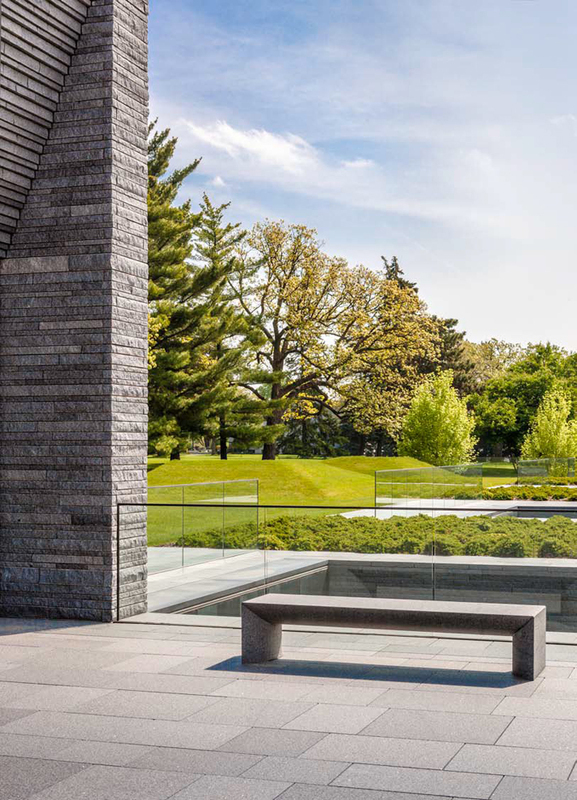 Already a remarkable place before the Mausoleum broke ground, Lakewood’s landscape and its small campus of buildings are enriched because it is there – framing a view, completing an edge, and embracing human scale. 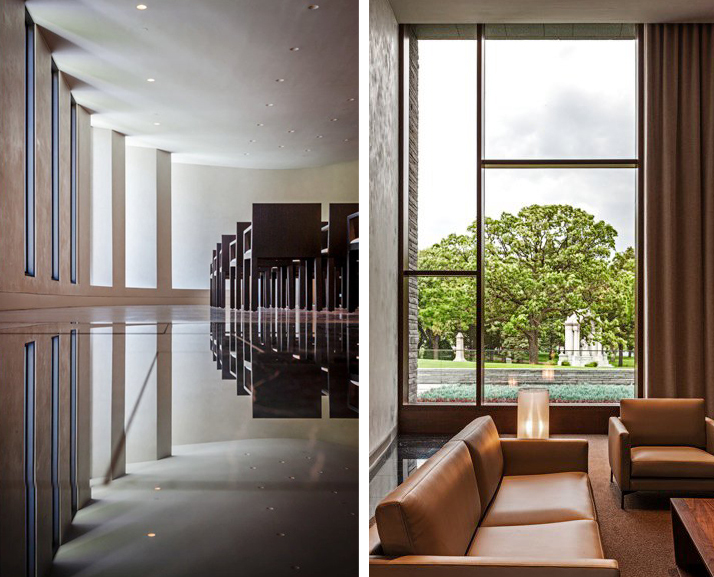 At this cherished haven within the city, architectural progress meets history with grace and a newfound vitality."